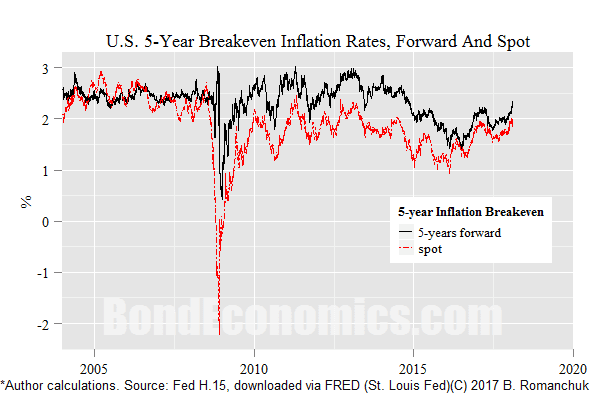 Bond Economics: Rising U.S. Breakeven Inflation - Mean Reversion Or Something Else? Rising U.S. Breakeven Inflation - Mean Reversion Or Something Else? There have been a great many attempts to pin the blame on the equity market correction on things other than the implosion of the short-volatility complex; inflation and fiscal policy being commonly-cited culprits. I do want to wander into equity analysis, but the move in breakeven inflation has been interesting. In particular, my approximation of forward inflation has gone back to its pre-2015 average relatively quickly. As a disclaimer, this article was written before the highly-anticipated CPI release. I do not think the subsequent pricing changes will be enough to matter from the "big picture" perspective of this article. Such a rise in the inflation breakeven could be interpreted as a reversion to its historical mean. Mean reversion is not a cherry-picked property in this case. By looking at the forward breakeven rate, we eliminate the near-term effects on inflation, such as oil price changes over the coming year. We instead are isolating what the market is pricing as a steady state inflation rate. We would expect it to be related to the central bank's inflation target, if the target is credible. * Since CPI inflation is biased higher relative to the Fed's preferred PCE measure, a value above 2% is not surprising. Therefore, I do not see any reason to get excited about this market movement. It is easy to argue that the TIPS market moved from being cheap to being fairly-valued on this measure. The fact that it happened rapidly is the typical pattern of behaviour of fixed income. Bond yields are characterised by range-trading punctuated by rapid trending movements that move yields into a new trading range. This is behaviour designed to maximise the pain for anyone attempting to use technical analysis. This obviously bears watching, but behaviour would not be in any sense unusual so long as the forward inflation breakeven remains below 3%. Are there fiscal risks to inflation? I frankly have no idea what the Republicans will finally implement as a fiscal policy, so I am not going to waste your time with any forecasting exercise. I just want to comment on where we are now. I am completely unimpressed by stories about fiscal risk based on the dollar amounts of debt. The real risk to fiscal stimulus for the United States is inflation (of some sort). Republicans complain about Democrat-leaning economists being pro-stimulus when Obama was President, then flipped when Trump was elected. I am not going to defend any particular analysis, but one can see a problem if we step away from the aggregated analysis that is commonly used. That is, the implementation of fiscal policy matters, and not just the dollar amount of the deficit. In other words, one might argue that the policy mix preferred by the Republicans is inherently more inflationary. Once again, since it is wildly unclear what the Republicans will do, so I am not saying that this is necessarily the case. However, it is possible. Left to its own devices, I think that the United States economy is well away from a rise in inflation. Inflation does rise during an expansion, but we are about a decade into the expansion. If there were any tendency for an endogenous acceleration, we would probably have seen it by now. However, it is clear that some sectors (and/or regions) of the economy are bumping into capacity constraints. Something has to explain the current inflation level, after all. The figure above highlights the most obvious candidate for hitting capacity constraints: the supply of college-educated graduates. 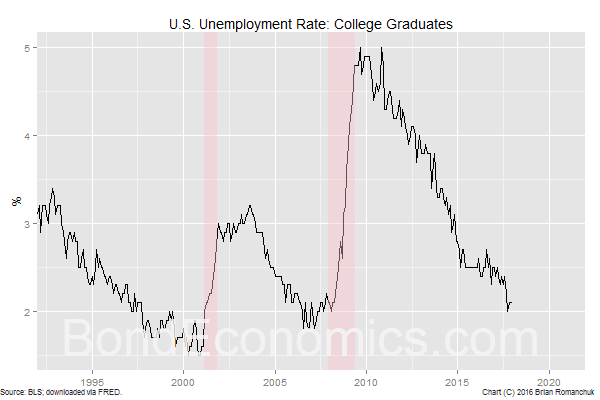 The unemployment rate for this cohort has fallen close to the lows of recent cycles. This contrasts to other wider measures of underemployment in the economy. It's a two-speed economy; the areas that are doing well are resembling the norms of the recent past. My guesstimate for the reason why this has not spilled over into stronger sectoral inflation is that there is still a good amount of underemployment based on credentials. That is, firms are insisting on hiring college graduates for roles that were historically filled by high school graduates. As the labour market tightens, employees with less education can enter those positions, freeing up college graduates to fill other openings. What could conceivably make things more interesting is a large fiscal stimulus that hits the strong areas of the economy, on the theory that benefits will trickle down to other sectors. That is a likely recipe for strong sectoral inflation rates, with a more limited effect on overall employment. However, this may be counter-balanced by benefits cuts, which will have a high-multiplier impact on weaker regions. I am not a fan of the policy mix, but I am uncertain what the net effect will be. * The discussion about valuation is a high level summary of valuation analysis found in the upcoming breakeven inflation report. For example, there are hidden disclaimers about my comments about the inflation target. The report does not give trading models, but covers the issues that such models should take into account.